Windows operating systems, ever since Windows Me in 1990s era, include a feature that helps to recover the system in the event of BSODs (Blue Screen of Death), errors, crashes, driver conflicts, system files or registry corruption, application malfunction, and even malware infections. The feature is System Restore, which allows user to revert and rollback the system to a state at a previous point in time. In Windows ME through Windows XP, System Restore works by monitoring changes for certain set of file extensions, and then backs up the files before any changes is made. Beginning from Windows Vista, Shadow Copy (also known as Volume Snapshot Service or Volume Shadow Copy Service or VSS) technology is implemented. Shadow Copy allows block-level changes in any files located in any directory on the volume to be monitored and backed up (as in system snapshot is taken), and as such greatly improves the functionality of System Restore such as ability to be used from Windows Recovery Environment and Preview Versions. Windows normally automatically creates System Restore points before installation or uninstallation of software application installation, drivers or Windows Update. System Restore points could be manually created through “System Protection” tab of “System Properties” in “Control Panel”, or you can also automatically trigger creation of System Restore points with scheduled task. In addition to using System Restore to revert the complete Windows system to a previous state, Windows OS also support usage of Previous Versions to recover files and folders that may be lost, deleted or changed from when the System Restore points were created. 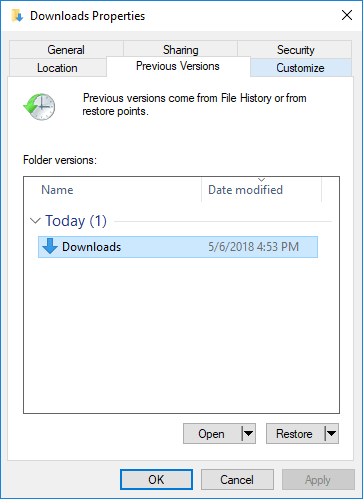 Previous Versions is the official GUI way to view the content of System Restore points and/or File History. To view the files that were backed up by Shadow Copy, right click on the file or folder, and select “Properties”, and then go to “Previous Versions” tab. However, Previous Versions may not be working properly, as might omit some of the shadow copies. Furthermore, the ‘Previous Versions’ window doesn’t allow you to access or copy system files unless UAC (User Account Control) is turned off. And the Previous Versions is generally not so intuitive if you want to restore many files and folders, or simply want to browse or preview the data that contained inside the System Restore points. To easily the access to the wealth of data in System Restore or Shadow Copy, you can make use of third party utilities that allow you to view and access all files saved by System Restore / Shadow Copy. Using Shadow Explorer is very easy, and no mounting is required. Just run the program, and then select the drive (must have System Restore enabled) and one of the available point-in-time Shadow Copies to start viewing all the files and folders available at the particular point-in-time. Right click on any files or folders to export the content. 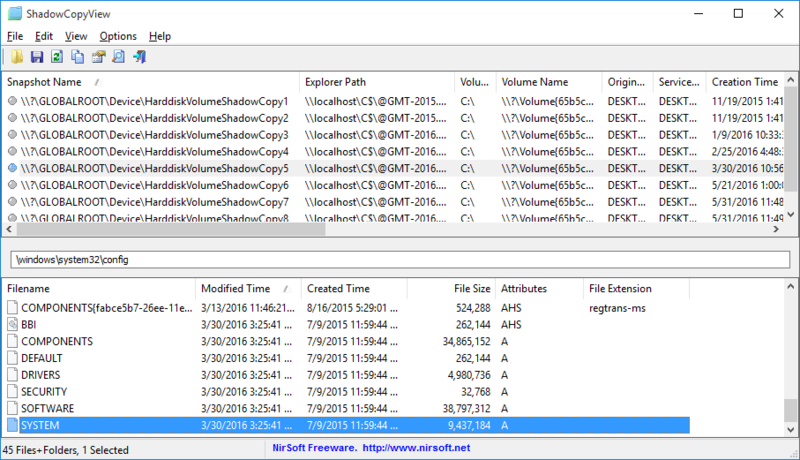 ShadowCopyView is simple tool for Windows 10/8/7/Vista that lists the snapshots of your hard drive created by the ‘Volume Shadow Copy’ service of Windows, which contain an older versions of your files and folders from the date that the snapshot was created. 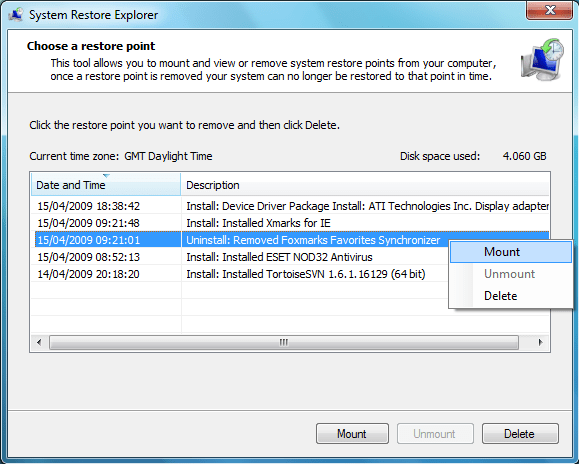 System Restore Explorer is a tool that has been designed specifically for the task of viewing and copying files from System Restore points without the requirement of having to restore the whole set of backed up files. The program works by mounting the selected restore point as a virtual folder using the Volume Shadow Copy Service, from which you can then view and copy files. 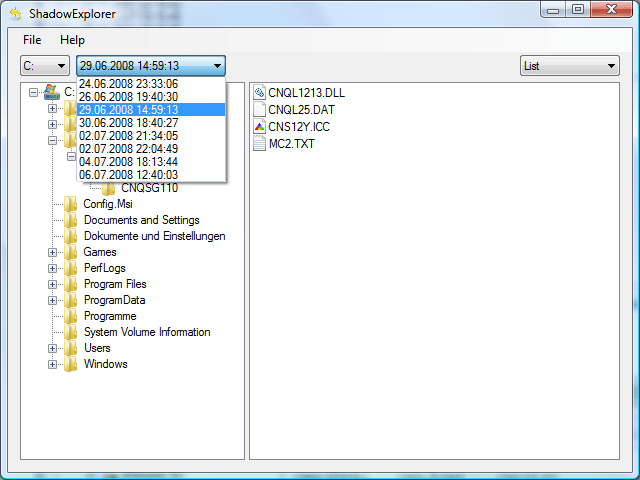 Shadow Copy Explorer is derived from System Restore Explorer, and has largely same features. 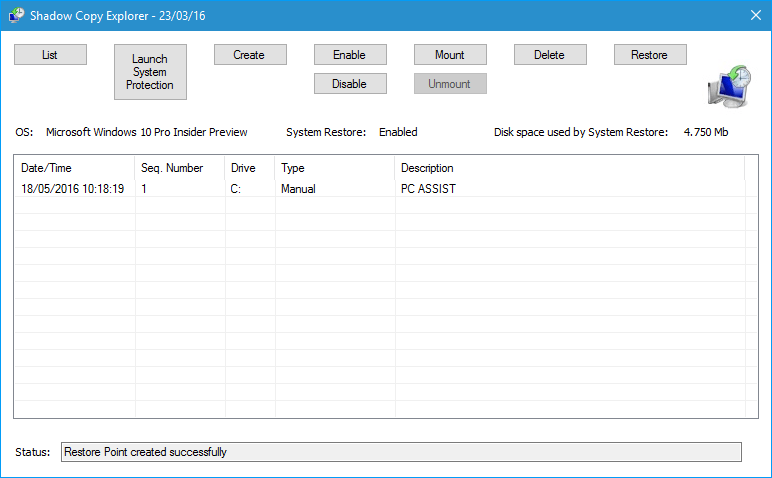 Shadow Copy Explorer allows you to mount and browse System Restore points (also known as Shadow Copies) and Preview Versions on Windows Vista, Windows 7, Windows 8, Windows 10, Windows Server 2008 (R2), Windows Server 2012 (R2), Windows Server 2016 or newer. With the app, you can easily recover files without having to perform a complete restore, in addition to ability to delete points, create points and see how much disk space is being used by System Restore points / Shadow Copies. Previous Version File Recoverer was previously known as Vista Previous Version File Recoverer and Windows Previous Version Recoverer. Previous Version File Recoverer allows users to easily recover previous versions of files in Windows Vista, 7 and 8. Recover previous versions of files hidden in Vista Home Basic and Premium. Explore restore point file system snapshots saved in Windows Vista and 7. Access previous versions of files in Vista and Windows 7 without resorting to the right-click/context menu.